James Morrow joined the staff of the MBCH Foundation in January 2008 as our Development Officer (DO) for East and Northeast Missouri. In July of 2015 he began serving as Foundation Services Manager, and on July 1, 2016, James took on the role of Vice President of MBCH Foundation. In this position James is responsible for managing MBCH Foundation staff including our four regional representatives that work with local churches, pastors and MBCH donors. Additionally, he oversees the areas of special events, tax credit administration, deferred giving and grant writing. James and his staff make group presentations and presentations to individuals sharing the ministry challenges and opportunities of the Children's Home and showing both groups and individuals how they can be personally involved in this vital ministry to children. James is trained to lead Christian Stewardship Seminars and can meet with individuals to help them find answers to their questions and solutions to meeting their planning objectives. James received a B.A. in Bible from Southwest Baptist University, Bolivar, Missouri in 2005, in 2010 he earned his MBA from William Woods University, and is currently working on his MTS (Master of Theological Studies) from Midwestern Baptist Theological Seminary. He served as pastor to First Baptist Church of Climax Springs, Missouri for 2 years and was employed with the March of Dimes Foundation, Ozark Division, in Springfield, Missouri. James and his wife, Danielle were married on June 18th, 2005, and have one son, Patrick Evan, and two daughters, Jamie Grace and Kierlin Marie. Dr. Robert C. Springate joined the staff of Missouri Baptist Children's Home in November of 1985 after having served on the Board of Trustees for 9 years. He has served as a Development Officer (Regional Representative), Development Coordinator, Chief Operations Officer of MBCH Foundation, Vice President of MBCH Foundation and July 1, 2016 he returned to his role as Regional Representative for Northwest Missouri. Dr Springate’s responsibilities include making presentations to both individuals and groups sharing the ministry challenges and opportunities of the Children’s Home and showing them how they can be personally involved in this vital ministry to children, youth and families. Dr. Springate is also available to lead Christian Stewardship Seminars that deal with estate planning. He is also available to meet with individuals and couples to help them find answers to their estate planning questions and solutions to meet their estate planning objectives. Dr. Springate’s background includes having served 14 years as a pastor of Missouri Baptist Churches. He also has several years’ experience as a financial planner with a major financial services company based in Kansas City and he has developed curriculum for and led hundreds of money management seminars as well as estate planning seminars. Dr. Springate received his B.A. in Speech and Communications from William Jewell College in 1969. He received his M.Div. and D.Min degrees from Midwestern Baptist Theological Seminary in 1973 and 1980 respectively. As a ventriloquist, Dr. Springate works with multiple figures. His first partner's name is Danny Driftwood. Danny is also a ventriloquist and his partner's name is Mortimer. A blonde named Chrissy also travels with them. Dr. Springate and Danny have preached and entertained groups of all ages for churches, schools, community groups and business functions. They have entertained all around the Midwest as well as in Central and South America. Dr. Springate is married to Juanita and they have two grown children who live in the Greater Kansas City area. Dr. Keith Vawter joined the staff of the MBCH Foundation in January, 2007. Keith first came to MBCH Foundation as Development Officer for Central, South Central and Southeast MO. On June 1, 2015, Keith shifted his responsibilities to become Development Officer for Southwest, MO. Keith lives in Ozark, Missouri and his responsibilities include not only fund raising but also the recruiting of families and individuals interested in working with hurting children through employment opportunities, our foster-adoptive program, visiting resource program or as a volunteer. In fund raising, Keith makes both group presentations and presentations to individuals sharing the ministry challenges and opportunities of the Children's Home and showing both groups and individuals how they can be personally involved in this vital ministry to children. Keith is trained to lead Estate Planning Seminars and meets with individuals to help them find answers to their questions and solutions to meet their estate planning objectives. Keith received an AA degree from Southern Baptist College, College City, Arkansas in 1973, attended Missouri Baptist College and received a BS in Religious Education and Master of Science in Education from Southwest Baptist University and then received a Doctor of Theology from Andersonville Theological Seminary. Keith has served as pastor to churches in Arkansas and Missouri for more than 38 years and has served in Associational work in almost every position. He has also served as a trustee for Golden Gate Seminary of the Southern Baptist Convention and has served on the Executive Board of the Missouri Baptist Convention. Keith's wife, Debbie is retired. They have one daughter, Bonnie, and one granddaughter, Meagan. Kenny was born in St. Louis and raised in Hardy, Arkansas. He has a strong history in business management and sales. He has spent his entire life in the Baptist Church. He and his wife are active members of Temple Baptist Church in Sullivan. Kenny has filled many ministry positions in churches including nursery worker,teacher, music leader and deacon. He most enjoys working in children’s church. “It is very important to reach children for Christ,” Vawter said. Kenny is happily married with six children and sixteen grandchildren. Rev. D. Allen Calkins has been hired by the MBCH Foundation to become the Northeast Missouri Regional Representative. This includes the St. Louis Metro area as well as rural areas to the north and west of St. Louis. Allen joins three other Regional Representatives who share the ministry and the needs of the Missouri Baptist Children’s Home with MBC Churches and members. Allen has served as pastor of four Southern Baptist Churches in his 25 years of full-time ministry, all on the eastern side of Missouri. His most recent pastorate was First Baptist Church of Gray Summit. Allen has been a faithful supporter of the Missouri Baptist Children’s Home for many years. He currently serves as Evangelism Director for Franklin Baptist Association and is also a member of the MBC Christian Life Commission. In 1989, Allen graduated with a Masters of Divinity from Southwestern Baptist Theological Seminary in Ft. Worth, TX. Prior to entering the ministry he worked as a data processing professional for two Fortune 500 companies in Tulsa, OK. During that time he also earned his MBA from the University of Tulsa. Allen has been married to his wife Gerri for more than 40 years. He has two grown children and nine grandchildren. Jeffrey (Jeff) Hicks and wife Darla have lived in Springfield for the past 17 years. They are members of Second Baptist Church of Springfield where they are active in a number of different ministries. Since 2008 they have served as Foster Parents for MBCH and have adopted one son, Bradley during this time. They have one daughter and son-in-law, Katelyn and Grant Youngsma who are both graduates of Southwest Baptist University and teach in the Marionville MO Schools. Jeff comes to MBCH with many years of business experiences as a former business owner, corporate executive and financial advisor. He is a graduate of Evangel University (BS) and The University of the Southwest (MBA). Joann Britt joined the staff of MBCH Foundation in January of 2009 as Administrative Assistant to the Vice President. Her two primary areas of responsibility are 1) working with the new donor information system in tracking gifts and donor development plans and 2) working in the planning and implementation of special events. Before joining the Foundation Staff, Joann spent seven years as office manager for Lee's Summit office. During this time she served on the CQI (Continuous Quality Improvement) committee to develop and implement statewide filing systems for Foster/Adoptive and Case Management files and training to our partner agency in file maintenance. Joann also provided support to workers and families interested in and pursing training and licensing to become a Foster/ Adoptive home or Relative placement for children as well as children in state custody. Joann previously served as an International Adoption Consultant for Adoption Associates International providing consultation, education and support to families before, during and after the adoption process and with domestic adoption through Adoption by Gentle Shepherd. Joann is a widow and lives in Lee's Summit. She and her late husband lived in Raytown for thirty years where they raised a family of four. Daughter Johanna is a graduate of William Jewel College and is a pediatric nurse. Son Scott is an engineer. Two sons are deceased. She enjoys spending time with children, grandchildren and being active in her church. 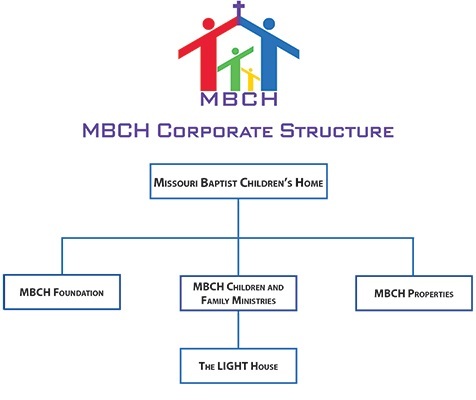 Trisha Crow joined the staff of MBCH Foundation in 2012. Trisha lives in Kirkwood, MO and serves as the Grant Writer for all of the Missouri Baptist Children’s Home affiliates. Her responsibilities include finding and developing funding sources, communicating with staff regarding needs and programs, writing and submitting applications, and managing any grants that are received. You will also find her helping at most of the MBCH events. Trisha has a Bachelor of Arts degree in political science from Truman State University and a Master of Arts in public administration from Saint Louis University. She worked as a housing consultant for many years. Her assignments varied widely from working with people displaced from their homes to working on applications for funding for low-income housing developments. The diversity of tasks has prepared her well for grant writing at MBCH. Trisha is married to Terry, and they have two rapidly growing children and one very shy cat. Cindy joined the Foundation staff in January of 2008 as the Assistant to the Director of Advancement and is presently the Administrative Assistant to the Foundation Staff. She has also taken on some of the responsibilities of the former Director of Advancement. Cindy is responsible for tracking all of the paper work for our various tax credits as well as help track projects that are tied to some of the tax credits. Cindy also has special events management responsibilities. Before joining the Foundation staff, Cindy was the Public Relations Assistant for 9 years for the Children's Home. As PR Assistant, Cindy produced the staff newsletter and had significant responsibility in the management of our donor data base, our special event data base, our memorial/tribute gift data base and our development production data base. Prior to coming to MBCH, Cindy was the Administrative Assistant to the Director of Development for Freeway Foundation (formerly the Christian Civic Foundation). Cindy also spent some time in the banking industry -- both as a domestic teller and an international teller. Cindy has been married to Keith since 1975 and they have three grown sons, Corey, Kyle and Kevin; one daughter-in-law, Nicole; one granddaughter, Cadence and one grandson, Eli.